You’ve said, “I Do.” You’re happily married to the love of your life. You have amazing jobs, you’ve taken trips and now you are ready to settle down and start a family. You’re both ready, and the timing is perfect. If only it were that easy for every couple. Jason and Tara Barnes met on July 16, 2011 through Jason’s cousin, Ashley. She introduced the two, and they immediately hit it off. They married in May of 2014 at Audubon State Park. “I probably would have started trying (to become pregnant) right away, but at the time in the job I was in, I knew I would be switching jobs and had went back to school and just knew the timing wasn’t right,” Tara said. Jason is a Police Officer with the Madisonville Police Department in Hopkins County. Tara is a Registered Nurse in the NICU at Methodist Hospital in Henderson. Before starting at Methodist as an RN three years ago, Tara worked three years at a Henderson clinic as an LPN while going back to school to become an RN. Once Tara finished school and received her dream job of becoming a NICU nurse at Methodist, they knew they were in a place where they would like to start trying to have a baby. They started trying Fall 2016 and tried all of 2017. “We tried, and it just wasn’t working. It was negative test after negative test,” Tara explained. Dr. Rashidian, at Methodist Hospital, is Tara’s OB-GYN. After months of trying, Tara decided to talk to him. She explained to him how she would take ovulation tests and sometimes it would show she was ovulating and other times not. He ordered bloodwork to be done, which all came back fine. They continued trying and were ordered to have an ultrasound scheduled. They found out her eggs wouldn’t mature on their own. They were there, but wouldn’t get big enough to form anything. That’s when Dr. Rashidian suggested they go see Dr. Gentry with Advanced Fertility Group in the Fall of 2017. Jason explained how Dr. Gentry initially wanted him to take some vitamins to see if it would help their situation. The couple was dealing with multiple factors between the two of them, and the combination of those problems wasn’t working in their favor for them to conceive. Dr. Gentry also suggested they try an IUI (intrauterine insemination) and oral medication together. “I really wanted it to happen on our own,” explained Tara. “It wasn’t my first go-to. I didn’t want to just jump in to make it work. I wanted the timing to be right.” Therefore, they tried on their own for three months with the medications. The first month, the medicine worked, but it didn’t happen. The second month, the medicine didn’t work at all so Dr. Gentry suggested they add an injection of a follicle stimulating hormone, which was more aggressive. It was January 2018 when they decided to go in to have the IUI done. “I would take the medication, it would mature my follicle and they would give me injections to induce ovulation,” she explained. Even with an IUI though, there is no guarantee it will work. However, Jason and Tara were blessed because the IUI worked the first time. It was the combination of everything Dr. Gentry suggested working together, and Baby Barnes was due September 2018. Tara is blessed to work with amazing co-workers. The girls she works with knew the struggle she and Jason were facing when they started trying to grow their family. “It was kind of hard to keep from them, but we are close because we spend long shifts together. About three months before we got pregnant, two of them got pregnant. I was so happy for them, but it hurt,” she explained. However, it turned into a blessing because Tara found out she was expecting a few months later, and they were all able to go through their pregnancies together. Tara explained how in the NICU, they always have withdrawn babies. It was extremely difficult for her because she was asking daily, “Why me,” yet there were women who came into the hospital year after year delivering babies who were suffering from withdrawal. It completely broke her heart to see what these babies were going through. She always feels drawn to these babies, and she just prays when they go home, they have a safe and healthy life. “This is my dream job. I was super excited when I finally got the job, and then it wasn’t long after I started my job we started trying. It was super hard going to work every day and taking care of what you want. I’m constantly surrounded by babies. They’re my life. I go to work, I take care of them. I come home. I just wish I could have one. That’s all I thought about 24/7. It wears you down after a while,” Tara stated. Tara also explained how when you are taking care of these precious babies, you get to know their parents. She knew they never meant anything by it, but so many would always ask, “Do you have any kids?” She would put on a smile and say, “Maybe soon.” Underneath that smile though, it was crushing her inside. Jason explained how they had a wonderful support system. They are close with their pastors and were able to talk to them many times. “We had people praying, or words given to us. Of course, God’s timing is His timing. It’s never our timing,” he explained. Jason and Tara were very torn at first on whether to go to a fertility clinic. Jason said, “I kind of felt like I was betraying God by saying you’re not doing it, so we are going to take it into our own hands and go see a fertility specialist.” One of their pastors was able to help them through this decision. He explained to Jason that God has given the talents to doctors and nurses, and whose to say this isn’t the path they are meant to take to allow the doctors to help them. “The way he explained it really helped me. It felt like a weight off my shoulders. We wanted to be as faithful as we could be. We wanted to do things His way,” he said. Tara said she felt peace when they arrived for the procedure. The doctor was confident it was going to happen. They were playing KLOVE, a Christian radio station, in their exam room and scripture was on the walls. It helped her remain calm and hopeful they were going to receive their little miracle. For those going through infertility, “Just dig into the Word and try to have faith. It’s hard when people say that to you. For a long time, I kept it to myself. It really helped me once I was more open, not only for prayer support but just felt better getting it off my chest,” she said. She also suggests scrapbooking, journaling and reading books. “You’ve got to have a support system,” Jason said. They had so many supporting them whether it was family, friends or church members. The continuous prayers and words of encouragement kept them hopeful for their precious baby boy, Bryce Allen Barnes, who entered this world on September 10, 2018, and what a miracle and blessing he has been since his sweet arrival! 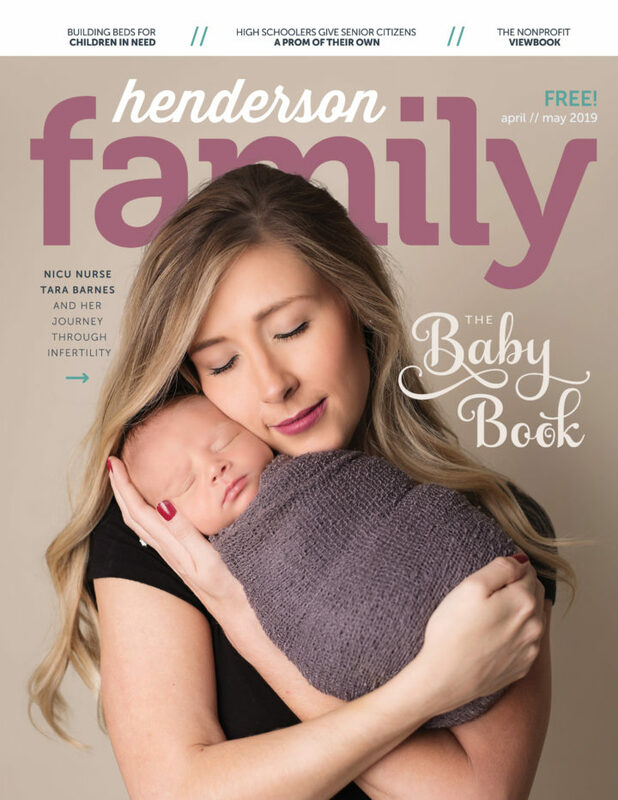 Lyndi Mauk, editor of Henderson Family Magazine, was born and raised in the Bluegrass State. She is grateful to be going through life alongside her husband and best friend, Brandon, and being a mother to their little girl.